Advertising your business in one or more of our program books is a great way to reach a diverse group of people in your community. 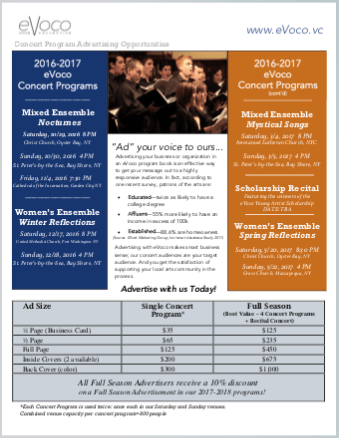 We have rates and sizes to match an array of needs, and businesses who choose to advertise in all three concerts of the season get one full program placement free. The current season’s Advertising Rate Card and Reservation Form with a full description of ad sizes and file formats accepted can be found here: Once you’re ready to buy, follow the instructions in the Ad Reservation Form, above, for digital or hard copy submission. If paying online, submit payment using the PayPal form below. 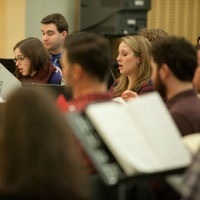 Our rehearsals are ALWAYS open–Join us! Be the first to hear about upcoming events, open auditions, and more. We promise not to bother you often, and we'll never share your email!